Did you catch this? 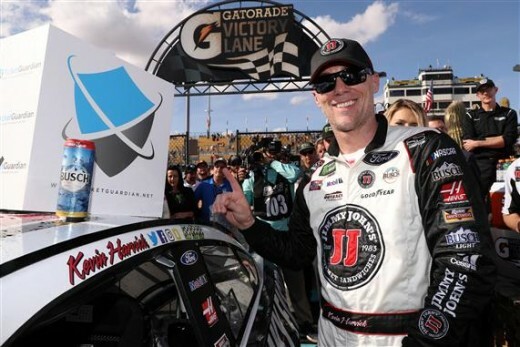 Not only did Kevin Harvick win his third straight race Sunday in the employ of Stewart-Haas Racing, all three of his teammates made the top ten. Clint Bowyer finished sixth for SHR. Aric Almirola took seventh. Kurt Busch- who looked like a possible race winner- placed 10th for Stewart-Haas Racing. Who thought that at the beginning of the season that it would by SHR leading the way for Ford and not Penske? Clint Bowyer appears to be finding his footing in his second season at Stewart-Haas Racing. The successor to Tony Stewart now has two top tens and a top five to his credit. Sometimes it takes more than a season to really settle in with a team. The past few seasons have been quite an odyssey for the pilot of the 14. There was the ugly end at Michael Waltrip Racing, then a season in purgatory at HScott Racing before jumping in at SHR. Now things are looking up. Did you see that trackside with Tony Stewart? 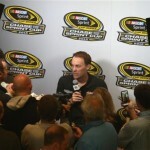 He quipped that the 10 team is getting much better results this year with Aric Almirola behind the wheel. The comments were a not-so-veiled swipe at Almirola’s predecessor Danica Patrick. Were the poor finishes the 10 car had in the past the car or the driver? We’ll let you decide. Let’s just say that Double-A is one spot behind Bowyer in the season’s standings. Bowyer is 9th, while Almirola has a pair of top tens in his first season at Stewart-Haas Racing, good enough for 10th. Guess who’s 11th? If you answered “Kurt Busch,” you’d be right. So far, it’s been feast or famine for the 2004 champion. Thus far, he has two top tens and two DNFs. You can see the competitive fire and skill is still there. The 41 took stage two and looked very solid. 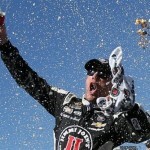 Stewart’s words after the race at IMS in Phoenix indicates his pleasure with how things are progressing at Stewart-Haas Racing. Certainly, Kevin Harvick is far from a one man gang for SHR. From top to bottom, good things are going on for the organization that was once Haas-CNC Racing back in the day.